Making pajamas for my littles never gets old for me. I don't know, perhaps it's the idea that they are all snug and tucked into their beds with handmade love all around them. Maybe it's because you can make them especially special for specific occasions or maybe it's just because I think they look so darn cute in pajamas! 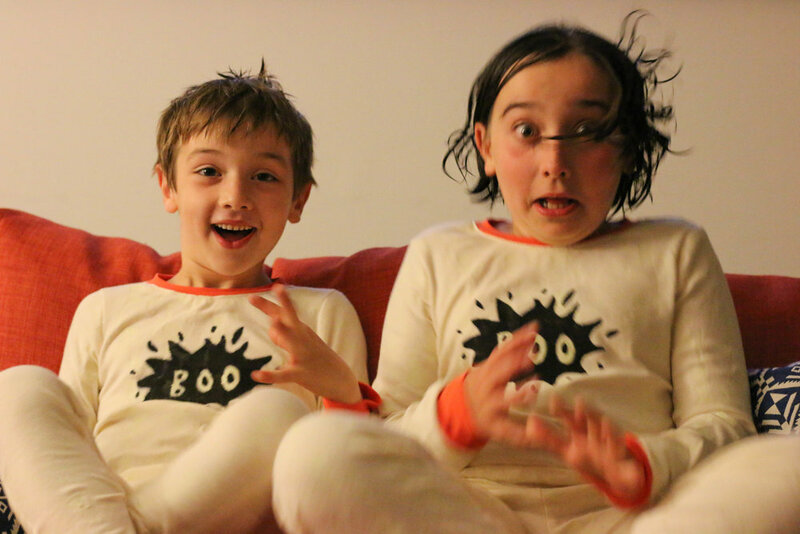 Each year I find myself making pajamas for a variety of holidays...and always Halloween! This year I went beyond the typical finding fun holiday appropriate fabrics and instead, made my own! I started with several sheets of dancing skeleton stencils and used Tulip soft brand, glow in the dark fabric paint. Initially I thought I'd make the pajamas with black fabric and use white paint, but after testing my paint on a few different fabrics including black, grey, and white I found that the "glow in the dark" aspect worked by far the best on white fabric. I will say that I severely underestimated the amount of time painting was going to take. I also severely underestimated how many yards of fabric I was going to need and ended up needing to go back for more! Needless to say, all of that made this project a "several days" project as opposed to your typical "toss together some jammies in a couple of hours" project. But, oh, they were so worth it! I added a little "BOO" freezer paper stencil to the shirt fronts and made the cuffs and neckbands orange to add just a touch of color instead of completely white pajamas. Not to mention, the "BOO" made for more fun picture taking! There were lots of giggles and scares! And a bit of dramatic acting as well! But, the best part? Well, of course the best part came when we turned off the lights! And those little skeletons came out to show off their dancing, glow in the dark selves! There were literal squeals of delight when the lights were turned off! Not only from the kids, but from my mouth as well! I could not believe how well it worked! This paint is super bright and shining. While, next time I likely won't make an all over glow in the dark pattern, I am truly thrilled with these results and the kids and I are already coming up with our next glow in the dark project! Because, really, how can we not? So much fun! Perfectly spooky for Halloween! Also, to note...I have washed these pajamas following the directions to turn inside out for washing and tumble dry low, after washing they were still just as brilliant. I did wash them alone for the first washing just to be safe.